Originally published in 1982 and re-issued in 2016, Pauline Gedge’s Stargate is a sci-fi/fantasy hybrid writ large. Its universe rides the mythic themes of a world overseen by Gods who live within the vague rules similarly employed against their literary and cultural brethren in Olympus. Gedge seems more than happy to borrow these Grecian mythic motifs while putting her own sci-fi/fantasy spin on the creation myths we find embedded within even modern religions. Important note before I continue: This book has nothing to do with the movie of the same name. Yes, there is a gate … that transports mortals and immortals across the stars … a literal “star” + “gate”. But any and all similarities end there. A myriad of gods exist in Stargate. Their hierarchy is transparent, though some of the gods’ specific roles are rather opaque. Gedge focuses on the Sun-Lords: all-powerful beings within their own worlds, and who exist as extensions of, and have power over, their suns. As long as their suns burn, they and their worlds remain strong. Their worlds are populated with mortals who have very little knowledge or understanding of their surroundings, and fully believe in an existence where their Sun-Lords walk among them. These gods are limited to traveling between worlds only through the use of their Stargates. Each world has a set of doors that open upon a star-filled universe. With one word, the name of their destination, the Sun-Lords drop from one Stargate to another. Thus, the gods interact with the mortals of their own worlds and the immortals that rule over others. At the start of Stargate, there exist only four Sun-Lords in addition to Janthis, who serves as Gedge’s version of Zeus — lord of the Gods. Ixelion rules over Ixel, a grey water-logged world; Danarion is lord over Danar; Sholia over Shol; and winged Ghakazian rules over Ghaka. Silly names aside, this story is heavy, dark and serious. It reads like a modern fable, with a novelist’s subtlety. The Stargate universe was once full of a thousand worlds, each with its own Sun-Lord. One by one, Stargates were closed forever; the gods were never seen again and, presumably, their suns darkened. We’re not provided a full backstory, but we learn of a spreading evil as Gedge exposes the tale of Ixel. His story is one of temptation: the allure of a legendary book that exposes the future of their universe to all who read it. We’re provided a glimpseof the destructive power that’s spread from planet to planet and it’s clear that the spread is quite focused and purposeful. We learn the legends of the Worldmaker. He’s a God among Gods. He’s much beloved, but has been absent in Gedge’s world for many eons. He’s the maker of worlds, but it’s clear that he’s also a tempter … and an UNmaker. These very Christian themes soon pervade each God’s story, which makes up the totality of the novel. Each world is an Eden. Led by their respective sun-lords, their lands are pristine; the mortals live long and prosperously and know no pain. Death is rare. Murder is simply not a thing. Each mortal is a true innocent. And, in many ways, so are the Sun-Lords. It’s not a stretch to see the religious significance in Stargate, which doesn’t attempt to mask the multitude of Christian symbols throughout the story. Stargate is Gedge’s fantastical creation myth drawn across a universe not dissimilar from our own. The scope falls within a vein of science fiction; and the characterizations and world-building could be considered fantasy. Stargate is a discourse on the cycle of life on both a human and universal scale. Gedge’s simple stories and bold characters enhance the magnitude of her story and give it a certain biblical scope and timescape. Originally published in 1982. In the earliest years of the history of the universe, the Worldmaker has turned against his creations with unaccountable malice. One by one the ruling sun lords of each solar system have fallen, succumbing to the lure of forbidden knowledge. The terrible punishment for their crime is isolation—the Gates connecting their worlds to the rest of the cosmos are sealed off. Their innocence lost, their civilizations hopelessly corrupted, the immortal sun people are condemned to languish with their subjects in an eternity of solitude. With courageous and often desperate measures the remaining sun lords now prepare themselves and their subjects for a battle unlike any they have ever imagined. The final struggle has begun. Unfolding with epic power, Stargate is conceived with a richness, subtlety, and depth that set it apart from most fantasy fiction. And like Pauline Gedge’s critically acclaimed historical novels, it is written with a vividness that is unforgettable. 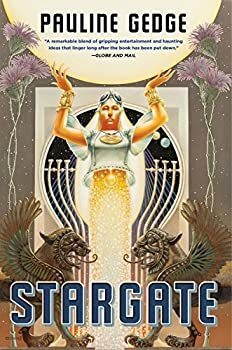 First published in 1982 but long out of print, Stargate is destined to be rediscovered and treasured as a major classic of fantasy literature. I recall her prose as being dense, and excellent. This looks like it would be a good one to read, since I don’t think I ever have.